Alaska is one of the most popular leisure fishing destinations in the world. Salmon, trout and halibut are abundant in its waters. 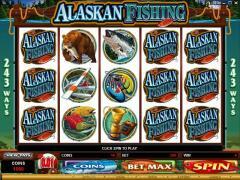 Microgaming brings Alaskan fishing to life on the reels in one of the best online slot games. King Salmon and Trout are the fish symbols. The fishing equipment consists of Tackle, Reel, Boat and Plane. There is a first prize Trophy as well. Humans are not the only fishers. The Bear and Eagle also grace the reels. The Alaskan Fishing Logo is the wild symbol. The Bait Box is the scatter symbol and the Fisherman is the bonus symbol. Alaskan Fishing has the 243 ways to win system. This implies that a symbol can occupy any position on the reel in order to count as a part of the winning combination. Players can choose between 1 and 10 coins. The Way Wins pay as per the payout table multiplied by the number of coins bet. For the total bet the number of coins is multiplied by 30. The bonus wins are multiplied by the total bet. The payout is converted to credits by multiplying the coins won by the coin size. 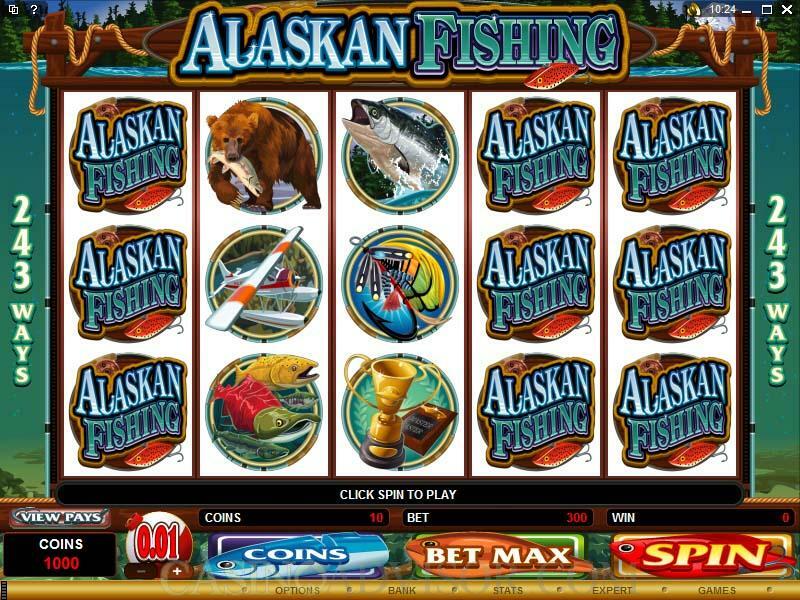 Alaskan Fishing offers only three coin sizes, which are 0.01, 0.02 and 0.05. The Fisherman appearing on reels 1 and 5 trigger the Fly Fishing Bonus round. In this bonus feature the player is taken to an Alaskan river with snow capped mountains in the background. The fisherman is waiting by the river. 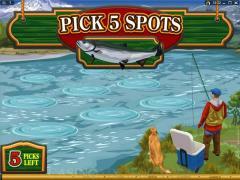 The player has to pick five spots one at a time in the river from those displayed. When the player picks a spot the fisherman lands his tackle there and pulls out a fish. The payout depends on the size of the fish, which are classified as small, medium or large. The smallest payout is 2 times the total bet and the largest payout is 15 times the total bet. Three or more Bait Box scatter symbols trigger the free spins bonus round. 15 free spins are awarded and all payouts are doubled during the free spins. The free spins can be retriggered. 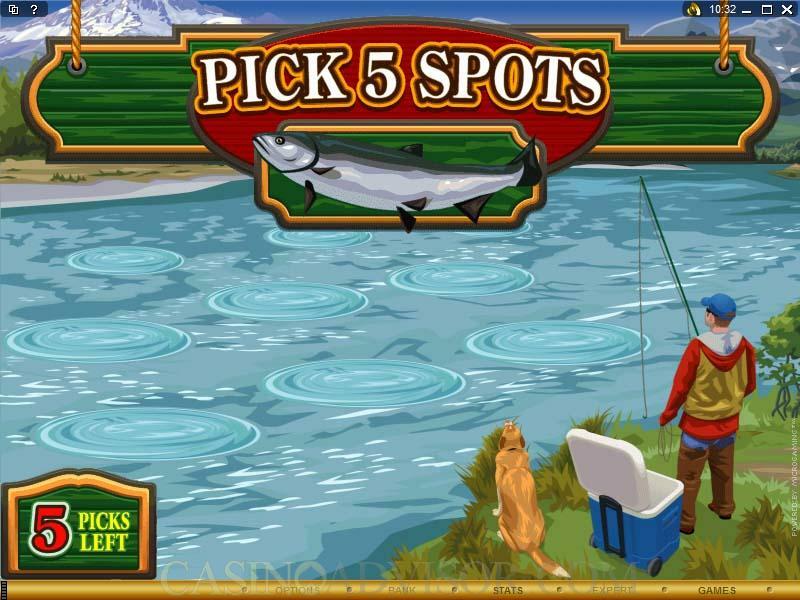 The Fly Fishing Bonus round can be retriggered during the free spins. If both the free spins and the Fly Fishing bonus round are triggered in the same spin the latter is played out first. Three or more Bait Box scatter symbols also offer scatter payouts. The Alaskan Fishing Logo symbol is the wild symbol and substitutes for all symbols except the scatter symbol and the bonus symbol. It substitutes for the Fisherman symbol if that symbol is not acting as a bonus symbol. This symbol appears as stacked symbols in the base game and free spins. Interested in reading more detailed information about Alaskan Fishing? If so Click Here for more details.